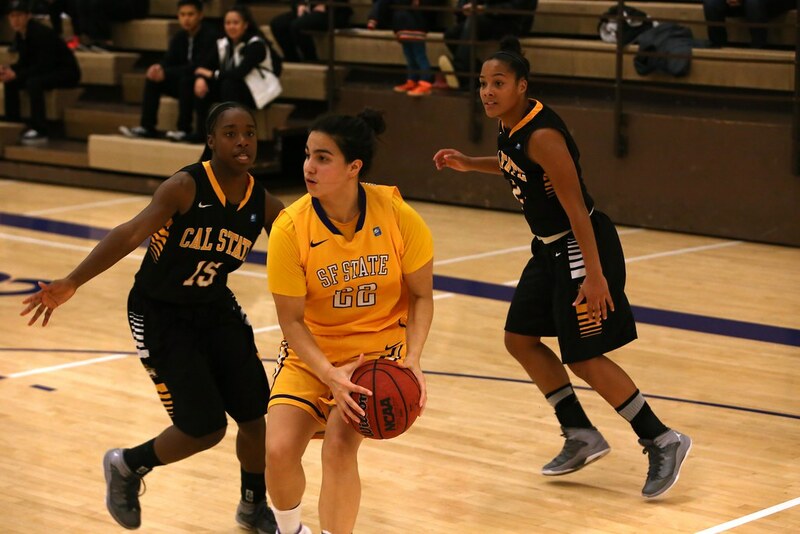 After a large victory against Cal State Los Angeles Jan. 3, SF State’s women’s basketball team suffered a surprising loss 67-55 during last weekend’s game. The Gators couldn’t make a comeback as CSULA’s bench outscored their entire team, dropping them to 8-8 in CCAA and 12-10 overall. With the loss, SF State could not pull into a tie for fifth place in the conference and now sit one game behind Cal State Stanislaus and Cal State East Bay. Guard Angela Van Sickel led the Gators with a total of 17 points, scoring 13 in the second half. Turnovers were a problem for the Gators all game, as they couldn’t take care of the ball and committed a season-high 19 turnovers. Guard Katie Batlin scored 12 points with eight rebounds, while forward Lauren Varney scored 11 points with nine rebounds. Cal State Los Angeles forward Aiwekhoe Okungbowa led the Golden Eagles with a game high of 26 points. The Golden Eagles have had SF State’s number the past couple years, as the Gators’ win earlier this year improved them to 1-5 against CSULA since the 2011-12 season. SF State beat the Golden Eagles 80-57 Jan. 3 for the first win against them in three years. The Gators played the night before when they trumped the Cal State Dominguez Hills Toros 66-53. Batlin and Varney led the game against the Toros, scoring 16 points each. SF State will host two games next weekend, Feb. 14 and 15 against Humboldt State University and No. 16 ranked Cal Poly Pomona.